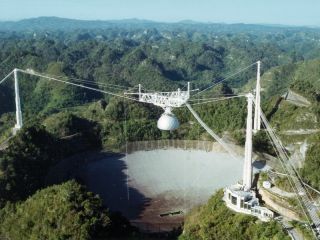 Radio telescopes are used to search for ET. But is it a smokescreen? A conspiracy theory's recipe is disarmingly simple: all you need is an occurrence, the suggestion of a dark cabal, a wilful disregard for evidence and a creative mind. Critically, however, once released the tale takes on a life of its own and begins galloping around the globe. As it travels, self-appointed experts begin picking it over, searching out 'the real truth'. Layers upon layers of detailed information are added to what may originally have been an overheard whisper, a lie or just a simple misinterpretation. Here, PC Plus magazine examines 10 of the top PC-related theories and try to decide, once and for all, whether they are rooted in reality, or are nothing more than the result of too many paranoid and furtive imaginations. The truth is out there. The Theory: Michael Drosnin claims to have found hidden messages in the Bible using specially written software. Some say it's an elaborate hoax tailored to make money from book sales, but other conspiracy theorists cite rather more sinister motives, given that Drosnin gained the ear of top officials in the Israeli Mossad and the United States Department of Defense. In his book The Bible Code, Michael Drosnin describes how he used software to search for hidden messages in the Hebrew Old Testament. The messages allegedly foretold events that occurred thousands of years after the Bible was written. More importantly, other messages are warnings to the present age, the exact time at which computer technology would have been able to unearth them. PC Plus analysis: Scientific papers presented analyses of Drosnin's results and concluded that they're statistically significant. More recent papers, also reviewed by experts, say that they're not. We wouldn't dare join a debate being held by such eminent mathematicians, but perhaps the Bible itself has something to say on the subject. According to 1 Corinthians 1:27, "God chose what is foolish in the world to shame the wise; God chose what is weak in the world to shame the strong". In the light of this verse it would seem surprising that God would have left messages that could only be discovered by a powerful computer, and which would be argued over only by academics. But you'll have to make your own mind up on that one. The Theory: The US government knows that little green men exist – and it also knows that we'll never find them by listening for radio signals. So to keep us off the scent, it promotes futile SETI research. SETI stands for the Search for Extra Terrestrial Intelligence. It works by pointing large radio telescopes into space and listening for radio signals that have the hallmark of intelligence. To date, the scheme has found nothing, despite over two million years of processing time being clocked up in the SETI@ home program, where volunteers contribute PC time over the internet to analyse signals. COVER-UP: Is this really an alien listening base or perhaps something more sinister? PC Plus analysis: The well-known Drake equation allows us to work out how many civilisations in the galaxy we might be able to hear radio signals from. The equation itself is widely accepted, but there's considerable debate over the values of the variables it uses. Today's best estimates suggest there may be two or three such civilisations. Needles and haystacks immediately come to mind. So if it's well-known that the technology will have a very low rate of success, why bother using it? Are the conspiracy theorists correct on this one? Well, wait a minute. NASA might have had a SETI programme at one time, but it doesn't any more. The fact that SETI research now receives no public money seems to derail the idea that the US government are using it to distract us from the real way to reach aliens. The Theory: Forget mobile phone masts – school kids are now at risk from Wi-Fi access points in schools. Government is aware of the health risks but is suppressing the truth. This is a classic conspiracy theory because it's pretty much impossible to prove. Most scientists believe that low-power Wi-Fi doesn't constitute a health risk, but the only way to know for sure is to carry out large-scale tests over many years using kids as guinea pigs. PC Plus analysis: We're not doctors, but we are clued up in electronics. In Europe Wi-Fi access points have a maximum output power of a tenth of a watt – but a mobile phone can transmit two watts. As you double the distance to a transmitter, the field strength drops fourfold. Doing the sums, we conclude that if being two metres from a Wi-Fi access point for six hours a day is supposed to be harmful, using a mobile phone pressed against your skull for a second a day is 10 times worse. The Theory: Google has succumbed to insidious pressure from world governments to keep their secret geographical sites from prying eyes. Google Earth has brought us what was previously available only to the military: high-resolution satellite images of the entire planet. But some censored areas, it's suggested, are pixellated to prevent us from seeing the juicy details. PC Plus analysis: This has all the hallmarks of a classic conspiracy theory, but it's actually a fact – as the screenshot of a Dutch military base shows quite clearly.